Order your L. D. Bell Blue Raider Band Spirit Wear today! 2018 Summer Band will begin on Monday, July 23 and run through Friday, August 17. As a reminder, this is when we learn the majority of our marching band production and consistent attendance is critical to our success. A more detailed schedule of the rehearsal blocks will be sent out via Band News and posted to the website the week prior. For those who were unable to attend the meeting on Tuesday evening, the information presented can be accessed here. We are looking forward to a fantastic 2018-2019 season! Thank you to all who tried out for Color Guard and congratulations to the 2018 Blue Raider Band Color Guard. There will be an important parent meeting on Tuesday, April 24 at 6 pm in the Band Hall. Please let your parents know. Below is the itinerary for UIL Concert & Sight-Reading Contest Tuesday, April 17 & Wednesday, April 18 at Haltom High School. Parents are invited and encouraged to attend the performances. Training sessions for the 2018 L.D. 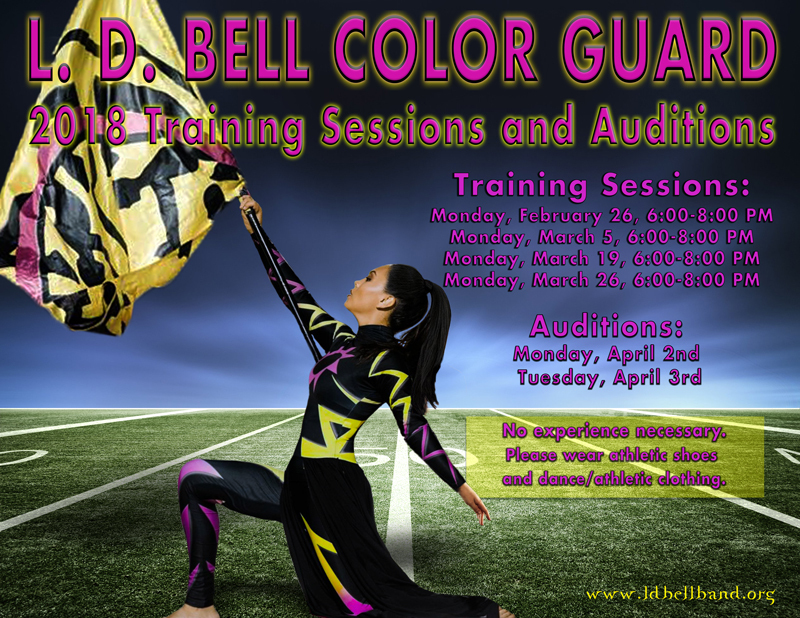 Bell Color Guard begin on Monday, February 26 from 6-8 pm in the Band Hall at L.D. Bell High School. Training sessions will be held on Mondays: February 26, March 5, March 19, and March 26. Auditions are Monday and Tuesday, April 2 & 3. No experience is necessary! Students should wear athletic or dance-type clothing. We hope to see you there!